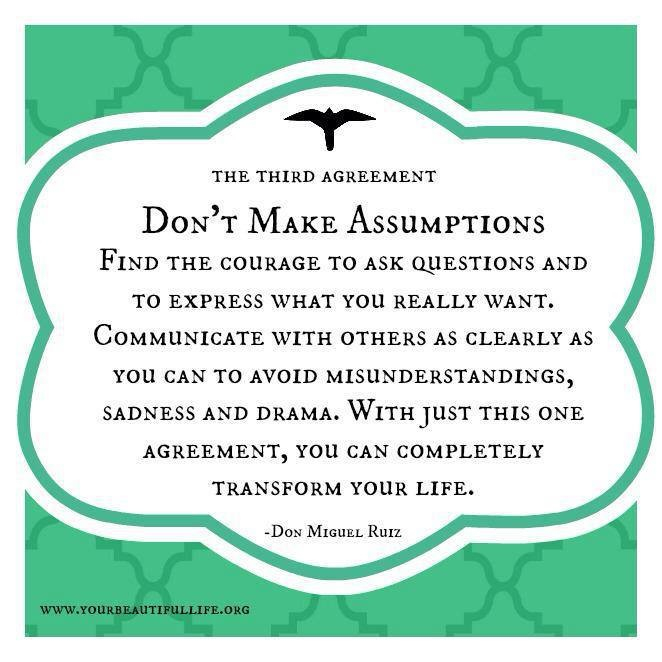 The Four Agreements was written by Don Miguel Ruiz in 1997. This book is one of the most influential books I have ever read. I would recommend it without hesitation to anyone who is interested in a few eye opening mental shifts that can greatly impact your life for the better. By applying a few easy to understand, although admittedly hard to implement, mindsets to your way of facing life you can put a lot of things in life in perspective. Things that drive many people bonkers (myself included previously) can be viewed in a new way that takes a lot of pressure off the way we see the world. And more importantly, the way we react to it. This book is short and written in an easy to understand format. When I first picked it up I read it cover to cover in about 2 hours. I’ve since read it probably about 6-7 time since, usually in bite size chunks as I pick it up and review it for 15 minutes at a time. I find myself continually going back to it for a quick refresher. 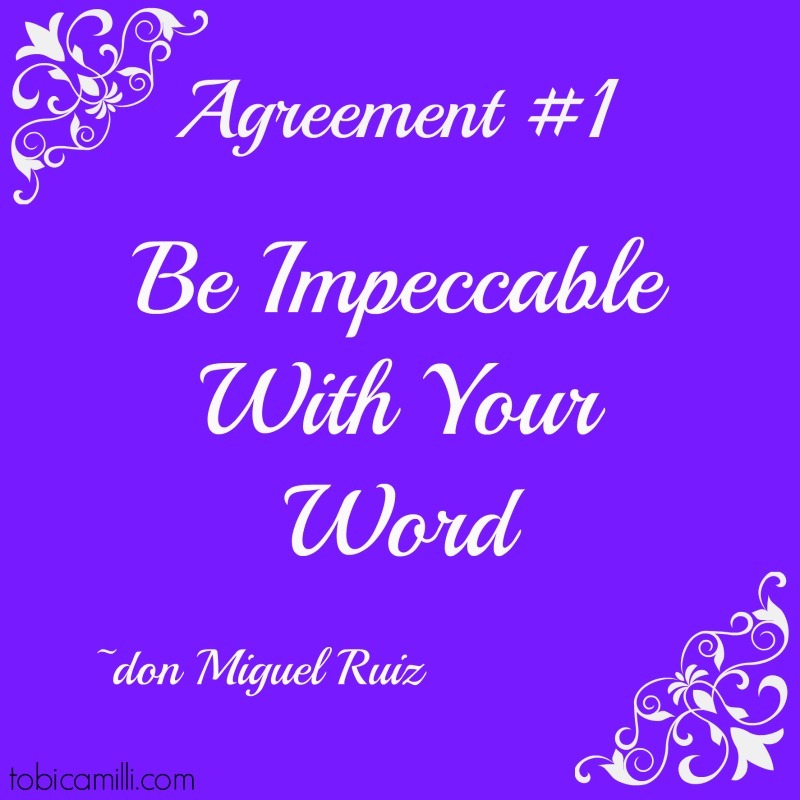 So I’ll give you a little background on Don Miguel Ruiz then hit the highlights of the book. 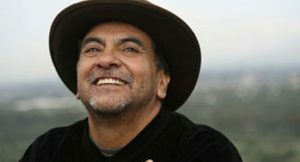 Don Miguel Ruiz was born in rural Mexico and was the youngest of 13 kids. After attending medical school he went on to become a surgeon. He practiced this career for several years until a near fatal car accident made him take a different direction. He spent some time with his mother who, along with his father, were healers and practitioners of ancient Toltec traditions. With his mothers guidance he went on to become a shaman and has created a combination of ancient wisdom, modern physics and practical common sense and in essence forged a new philosophy that he has been continuously sharing with others ever since. 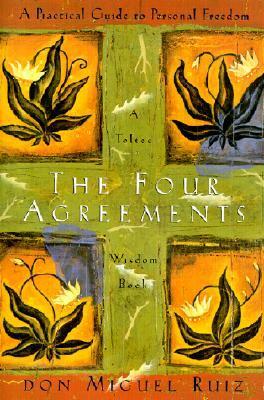 The groundbreaking book The Four Agreements was published in 1997. 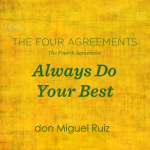 Besides this book he has also written and published The Toltec Art of Life and Death, The Four Agreements Companion Book, The Mastery of Love, The Circle of Fire, and along with one of his son’s The Fifth Agreement. He continues to spread his message across the world. 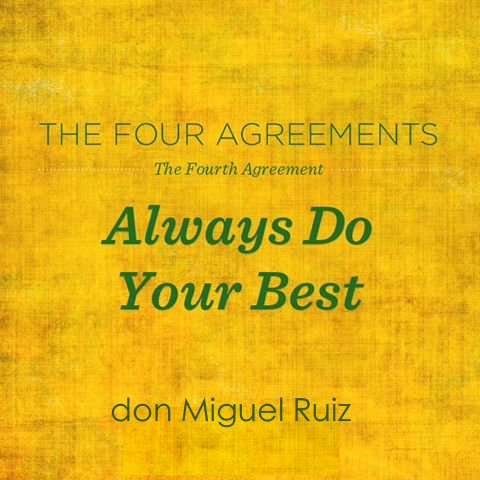 I had the privilege of seeing his son, Don Miguel Ruiz Jr., speak earlier this year regarding the Four Agreements. He, like his father, is a great conveyor of the message. “When you were in school, you sat in a little chair and put your attention on what the teacher was teaching you. When you went to church, you put your attention on what the priest or minister was telling you. It is the same dynamic with Mom and Dad, sisters and brothers. They were all trying to hook your attention.” We get domesticated like a dog or a cat. We get rewarded when we do something that society tells us is good and punished when we do something that society tells us is bad. He refers to this as the Book Of Law. After a while we become an auto domesticated animal. We no longer need others to judge us, we judge ourselves far more harshly than anyone else does. We punish ourselves for our mistakes over and over. Having a few of these agreements with society and other people is not so bad. The problem is we have many many agreements in our lives, and many of them make us suffer and fail in life. It takes a lot of strength and courage to break some of these agreements. He presents us with 4 agreements that he feels are some of the most powerful and will help you on the path to regaining personal power and will help you see and interact with the world in a way that leads to a much more fulfilling life with more inner peace. Be impeccable with your word. Don Miguel says this is the most important agreement yet the most difficult to to honor. So there’s several parts to being impeccable with your word. First of all, your word is a direct representation of YOU. You can use your word for either good of evil. He speaks of how if you are impeccable with your word you can create beauty and love. Your words have an impact on other people feeling better or worse. If you run into a friend of yours who is feeling really good about themselves on that day and you say something like “What’s wrong with you? You don’t look good”, or something similar then they will almost immediately start wondering why they look bad and in turn this can affect their entire outlook on life that day. Or for many days after if you say something mean to someone like a child. Conversely if you say something supportive and encouraging it can help someone feel better about themselves. He makes a special point of discussing how gossip is the worst form of black magic. Consider this when he says “Consider how many times you have gossiped about the person you love the most to gain the support of others for your point of view”. Powerful stuff – use your word for good. Don’t be part of spreading the black magic – gossip. 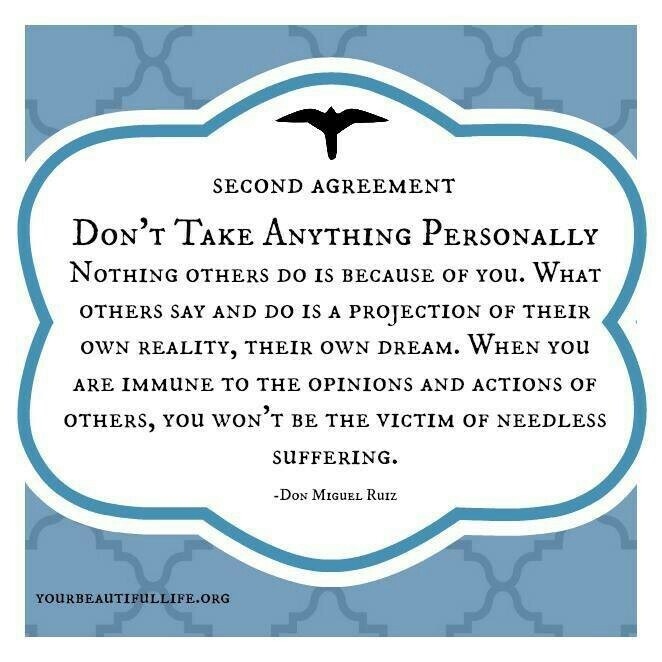 Don’t take anything personally. This one is my absolute favorite. When you take something personally you agree with whatever was said. As soon as you agree with something negative someone says, their poison gets injected into you. Nothing that anyone does is because of you, it is about themselves. I know this is a hard idea to get your mind around but bear with me for a minute. Remember that every single one of us has formed our own agreements along the path of life. We’ve all been taught and hooked with different ideas and ways the world should be. Each one of us at this point in time have our own ideas about how things should be. And they are all different. So when someone says something to you it’s born from how they see the world. They are simply reflecting their beliefs on to you. When you take things personally you set yourself up to suffer because of others points of view that have nothing to do with you. There is a massive amount of freedom to be had from not taking anything personally. This agreement has impacted me incredibly. Don’t make assumptions. The majority of the sadness and drama you’ve endured in your life comes from taking things personally and making assumptions. Think about this example for a minute, I’m sure it resonates with a lot of people. You decide to get married. When you decide to get married you assume your partner sees marriage the same way you do. The expectations, the activities, etc. Then you get married and live together and discover this is not exactly true. Argument after argument ensues because you two see the act of marriage as quite different. Let’s not forget how couples get mad at each other for assuming the other one “should just know” about something and then whatever it is always fails to meet that persons expectations (shocker). Develop the habit of asking questions until you are clear on what someone is wanting or needing. Conversely don’t be afraid to find your own voice to ask for what you want clearly instead of making someone guess. All of us are guilty of thinking someone is mad at them or doesn’t like them or whatever when so many times the person we are referring to is lost inside their own head on something going on in their lives. I have found that all of us are so focused on our own lives we consistently miss the real things others are thinking or feeling. I find this one to be particularly powerful as well. None of these are easy but once you find the courage to try them out you can see what a difference it can make. Always do your best. This agreement is about the action of the first three. Always do your best, no more and no less. Your best probably looks different from when you are energized vs. when you are tired. It’s probably different from day to day and can also fluctuate depending on your mood. Sure looks different sober than it does drunk. Whatever your state of mind or body at the time, do your best in that moment. If you do your best you won’t judge yourself as not trying and won’t suffer from guilt or blame or self punishment. And if you always do your best you won’t beat yourself up anymore in this regard and this will release a burden from your shoulders. If you are consistently doing your best you can look at yourself in the mirror and be confident and comfortable in the knowledge that you did you best. Doing your best is also about taking action vs not doing anything. And taking action always reclaims some of our personal power. I really like the way he explains societal rules as the domestication of the planet. If you allow your mind to take a bit of a deeper dive it really makes a lot of sense. Once you are able to get a good feel for the domestication of the planet you can see how we get hooked into others points of view on how the world “should be”. And how we make little agreements with what other folks tell us along the way. These 4 agreements seem so simple and intuitive. They are easy to understand yet hard to implement. 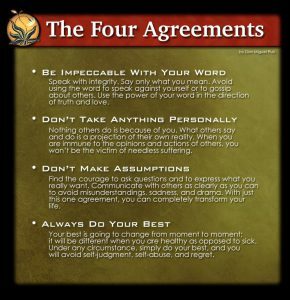 If you are able to start being aware of some of the ways these 4 agreements affect your life then you can start making some personal changes to break some of these agreements. And once you start to break some of these agreements from time to time you begin to feel the power of them. I stated this earlier but to me the power to not take things personally has seriously affected my life. That plus the don’t make assumptions are the two that have moved me deeply and made a very positive impact on my life. 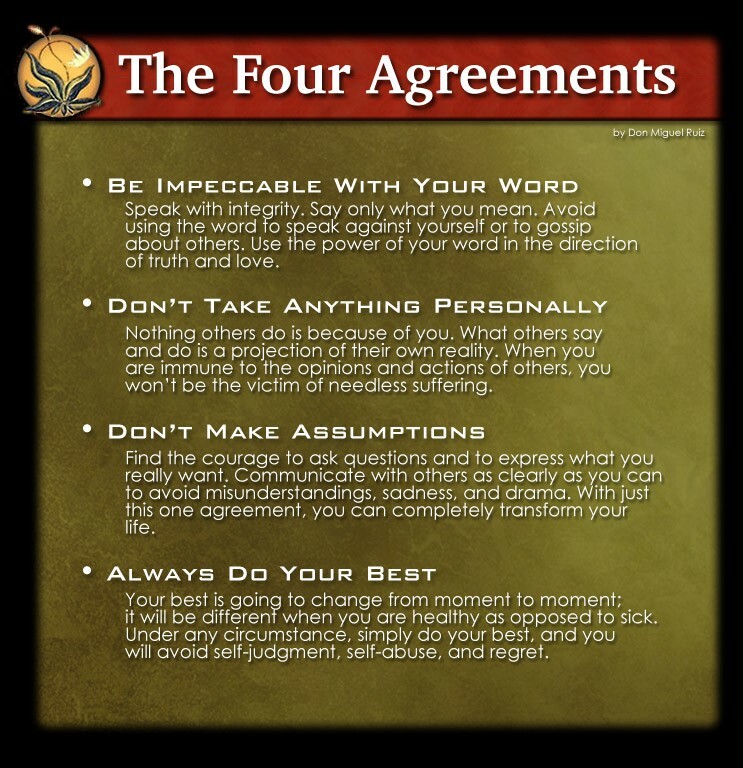 I highly recommend you pick up a copy of the 4 Agreements and give it a read. I further encourage you to try to live by at least a few of these agreements and see how they can impact your life. I’d love to hear from you if you’ve read the book and especially if it’s had an impact on your life. Thanks for reading! I have seen this book The Four Agreements every time I visit a book store, but I have never bought it. I will get this book of myself as a Holiday present. Thank you for stopping by and reading my review of the 4 Agreements. I am glad you liked my review. This is a popular book and for very good reason. I encourage you to pick up a copy of the book for yourself as a holiday present, you will thank yourself for sure! Thanks, Mat A.
Hi, Mat. The article that you wrote in reviewing the Four Agreements led me to some thoughts on what is so wrong in today’s world. 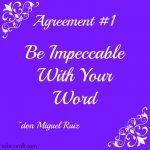 Understanding first what you wrote as being the “set up” to this outstanding work written by Don Miguel Ruiz, I feel that so many people in the world either purposely or unknowingly violate especially agreements #1, 2, and 3. 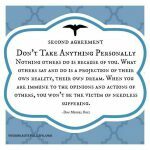 The reason why there are so much distaste that people have for one another in today’s world is a direct violation of the principle of agreement #1 and 2 – not giving fellow human beings your impeccable word and also not taking things personally. Human beings tend to lie to one another, especially if by nature one individual wants to take advantage of another. People also take it personally if insulted by others. Which is a direct correlation to the fact that people in general do not respect each other. Just witness what is going on for months now between the Presidents of the U.S. and North Korea, each a scant push of a button away from triggering nuclear arsenals that would potentially destroy the other country. 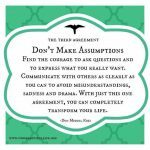 Face it if everyone could strongly consider making each principle behind the four agreements be the very fabric that controls their lives, the world would be a much better and safe place to live. Great article review, Mat! Truly worthwhile reading that every human being living on this planet should take the time to absorb! Thanks for your thoughts, I really appreciate it! I agree whole heartedly and a great example. It is crazy how personally people take things even when they have nothing to do with them! In reality in many situations like that people are quite honestly being kind of selfish by even thinking something is about them. Thanks again for the warm thoughts! Cheers! bought the book. looks like I have needed to read this for a while. thanks for the recommendation! Fantastic! Thanks Corey, I know you will enjoy it and get much out of it.